Muri is a key concept in Lean management. It stands for "overburdening". Find out what can cause Muri and how to deal with it. One of the main purposes of Lean management is to eliminate wasteful activities in the production process and optimize resources. Surprisingly, many lean practitioners go straight to tackling the 7 wastes, known as Muda while forgetting the other two M’s that are crucial for maintaining a smooth and well-organized workflow: Mura and Muri. In reality, identifying and removing Mura (unevenness) is extremely important if you want to create a steady work pace. However, at first, you need to identify the steps of your process that overburden the organization's work system. In other words, you need to spot Muri. After this, you will be able to analyze and optimize the work capacity of your workforce. Let’s explore what Muri is in details. Muri is a Japanese term meaning “overburden or unreasonable”. It is one of the three types of waste (?uda, ?ura, ?uri) and a key concept in the Toyota Production System. In other words, you create Muri every time when you put your team under stress by demanding unreasonable or unnecessary work that exceeds their capacity. Muri can drastically decrease your team’s productivity and efficiency. Putting too much pressure often translates to extra working hours, which will lead to occupational burnouts. Overburdening can have a negative effect on your team’s morale and damage the “health” of the whole work process. It is like in a football team: if you only put the whole pressure on 3 players because they are really good at some point they will get injured and then the whole team will struggle. So you need to be careful while trying to use the full capacity of your team. You should try to balance at the optimal capacity – a level at which all parts of the system are able to deliver results without the need for extra work. It is easy to say, but let’s discover what can cause Muri. You can overburden your teams without even realizing it. For example, setting unrealistic deadlines can force different team members to rush the work. This will often lead to poor quality and decreased customer satisfaction. If you tell your designer to make twice more images that she is able to produce for a certain period of time, she will probably do it, but not all of them will be of the highest quality. More or less it is like an assembly line. Imagine, you have the workers who check the quality of products and the faster you run the assembly line the higher the chance low quality products will go to your customers. There are many different reasons that can cause Muri. The first and more obvious is over-demanding. In the contemporary business world, it is quite surprising how higher management pushes more work onto their teams hoping that more inputs will somehow result in more outputs. In fact, this leads to a constantly increasing number of waiting tasks, which often results in chaos and burnouts. Companies often neglect the need of good training sessions. This is how at some point a team member can end up working on a task much longer than necessary. Let’s say that you are trained to work as a copywriter. However, the manager decides to use you as a designer. You will probably need twice more time to deliver good images than a regular designer will. Good communication is crucial for the success of any team. You need to establish clear communication channels and practices in order to avoid overburdening. Imagine that you have a meeting with 3 of your team members and you decide to make 10 new landing pages for your website. Everybody in the meeting agrees and the team starts to work on the project. However, it was just a verbal agreement and the designer was not informed for the project up until the last day before the expected deadline. Respectively, the designer will be overburdened and she/he will feel the negative effect of Muri because of miscommunication. When proper tools are missing, Muri is inevitable and obvious. If you give new computers to some of your developers for example, but the rest work on 5 years old machines, the second group will definitely feel overburdened because they will need much more time to complete their tasks using their old equipment. There could be many other reasons causing Muri. You need to remember that managing all of them will prevent the whole work process from collapsing. Now, let’s see how can you deal with Muri. Lean offers various tools and practices that may help you remove the negative effect of overburdening or at least reduce it to a minimum level. First, let start with mapping your team’s workflow. 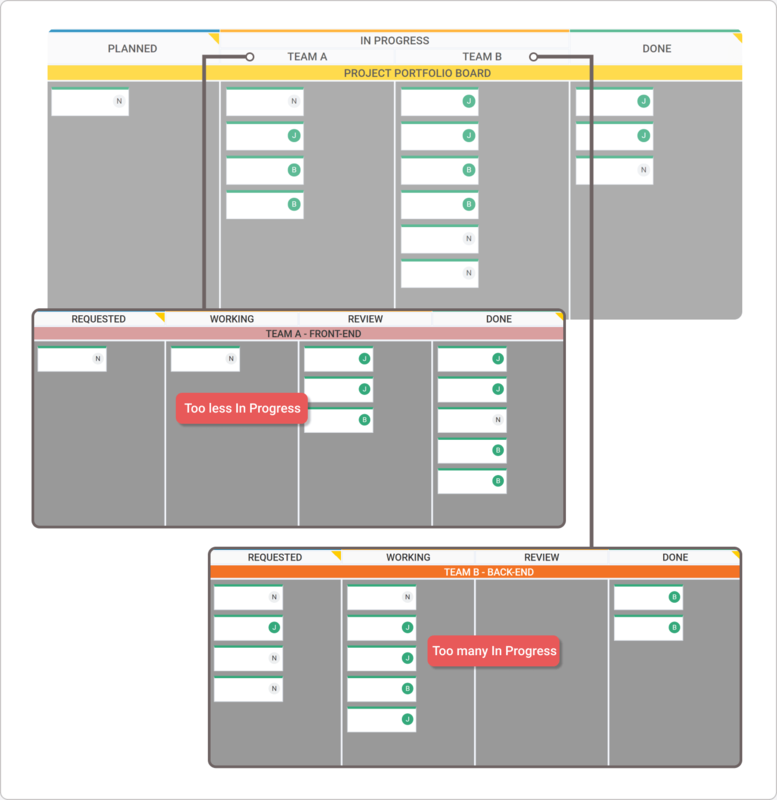 For this purpose you can use a Kanban board where you visualize the different stages of the workflow. By doing so you will be able to acquire a clear understanding of your team’s capacity and see where value is created. After this, you can set work in progress limits for each stage of the workflow. This way you will ensure that different team members will not work chaotically on multiple tasks, but they will be focused on completing current tasks before starting new ones. Simply, the application of WIP limits creates from Kanban an efficient pull system that will help you organize work better and prevent team members from overburdening. It gets a little bit more complicated on a global level. Very often there are two or more teams, whose work is inter-dependable. For example, let’s say that we have team A – developing new features for your software service and team B – deploying these features. However, team A delivers new features faster, than team B deploys. In this case, team B will always have a huge queue of requested work and their workflow will be overburdened all the time. Therefore, it is important to set WIP limits on a global level. So every time when team A starts working on a new feature, they need to be sure that team B has free capacity. Yes, team A can get blocked for a while, but they can redirect some of their capacity in order to help team B instead of overburdening them. In the business world, it is better to have one of your teams blocked, than all your company stacked. Another way of dealing with Muri is standardization. Having all processes documented and team members well trained will ensure that everyone is able to do the right work in the best way. Standard procedures will support good communication and it will help your teams avoid misconceptions. One more Lean management tool that can help you deal with Muri is Jidoka It is a simple practice that allows any team member to stop the work process if a problem occurs. Then the team needs to solve the problem before the work process continues. This way you create built-in quality standards and avoid rework. Additionally, you can do Gemba walks periodically, which is a simple “go and see” method that will help you have a clear understanding of what is actually happening and where Muri occurs. Train your teams properly and provide them with good tools and equipment. Create clear communication channels and practices.